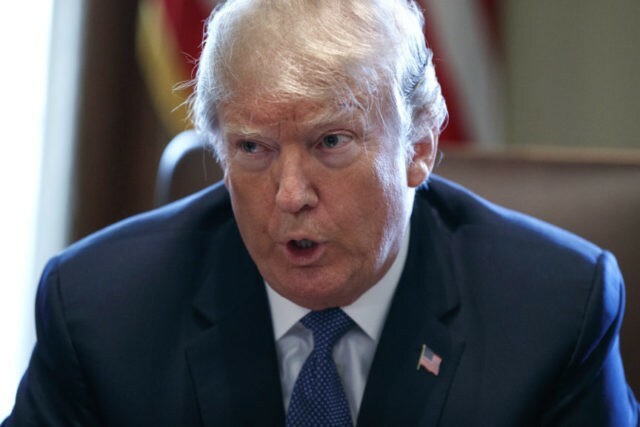 Trump said the U.S. is still investigating the possible involvement of the Iranian and Russian governments in the strike. Trump planned two meetings with senior national security aides Monday on Syria, in addition to a previously scheduled late-afternoon White House conference with leaders of U.S. military commands around the world. Monday was the first day on the job for Trump’s new national security adviser, John Bolton, who has previously advocated military action against Syria. The White House deliberations came as Russia and the Syrian military blamed Israel for a pre-dawn missile attack on a major air base in central Syria, saying Israeli fighter jets launched missiles from Lebanon’s air space. A group that monitors Syria’s civil war said the airstrikes killed 14 people, including Iranians active in Syria. Earlier Monday, Defense Secretary Jim Mattis took aim at Russia for what he suggested was its failure to ensure the elimination of Syria’s chemical weapons arsenal. The Pentagon chief said he would not rule out a U.S. military strike against Syria in response to a suspected poison gas attack. Over the weekend Trump threatened a “big price to pay” for the suspected poison gas attack. The government of President Bashar Assad has denied using poison gas. Officials in Washington were seeking to verify early reports by rescuers and others that the Assad government was culpable. The Russian military, which has a presence in Syria as a key Assad ally, said its officers had visited the site in a suburb of Damascus, the Syrian capital, and found no evidence to back up reports of poison gas being used. At a photo-taking session in the Pentagon on Monday, Mattis said “the first thing” to consider in how to respond was why chemical weapons are “still being used at all.” He noted that Russia was a guarantor of a 2013 agreement to eliminate Syria’s entire chemical weapons arsenal, suggesting Moscow shares blame for the suspected gas attack. “And so, working with our allies and our partners from NATO to Qatar and elsewhere, we are going to address this issue,” Mattis said in brief remarks to reporters as he began a meeting with the emir of Qatar. The U.S. military has a wide range of warplanes and other capabilities in the Middle East. They include sea-launched cruise missiles aboard ships within range of Syria. Syria’s state news agency SANA initially said Monday’s the attack on the T4 air base was likely “an American aggression,” but Pentagon spokesman Christopher Sherwood quickly denied the United States was behind the strike and the agency then dropped the accusation, blaming Israel instead. Saturday’s suspected poison gas attack took place in a rebel-held town amid a resumed offensive by Syrian government forces after the collapse of a truce. As U.S. officials consider whether and how to respond, they are looking at what type of chemical agent was used. When Trump ordered airstrikes last year after a chemical weapons attack, it was a response to the use of Sarin gas, which is banned by the Chemical Weapons Convention that Syria has signed. An attack with chlorine, which can be used as a weapon but is not outright banned by the treaty, could raise precedent issues, as there have been numerous recent allegations of chlorine attacks in Syria that have drawn no response from the Trump administration. One year ago this month, Trump ordered dozens of cruise missiles to be fired at a Syrian air base after declaring there was no doubt Assad had “choked out the lives of helpless” civilians in an attack that used banned gases. White House advisers said at the time that images of hurt children helped spur the president to launch that air strike, and television new shows on Sunday aired similar depictions of suffering young Syrians. AP writers Catherine Lucey and Zeke Miller contributed.